The After Dark party at Java one featured the Mythbusters. I really enjoy the show, so getting to meet them for a brief moment was way cool. They really liked the winning t-shirt launcher. The party was cool loud pounding urban techno with a cool light show. James Gosling should let Adam and Jamie build a t-shirt cannon for next year. The entrants would then compete against Adam and Jamie for longest throw and most radical design. 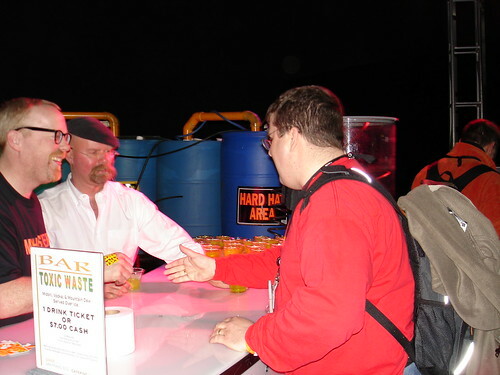 At the Mythbusters Toxic waste Bar at the party at JavaOne, originally uploaded by TomC.